Wedding Aisle Runners – Personalise Your Big Day! 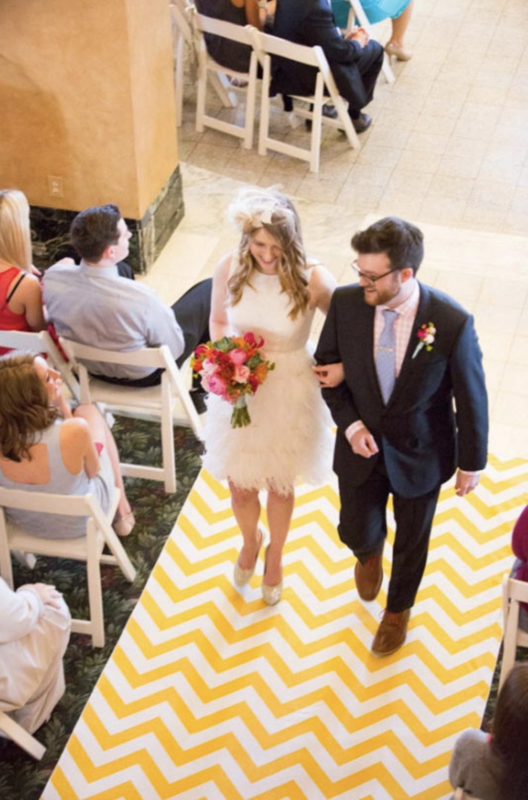 Make Your Day Super Special With An Exclusive Wedding Aisle Runner. Every wedding deserves to be totally unique and we think they really should be. A wedding aisle runner is a great way to make it that bit more unique. But, go totally creative for your big day, and walking down the aisle on a truly personalised wedding aisle runner would be exactly that. What a way to enhance your wedding décor and the ultimate way to add your own flair to the ceremony. Whether you’re a wedding planner or arranging your own day, we’re here to help get it done right. 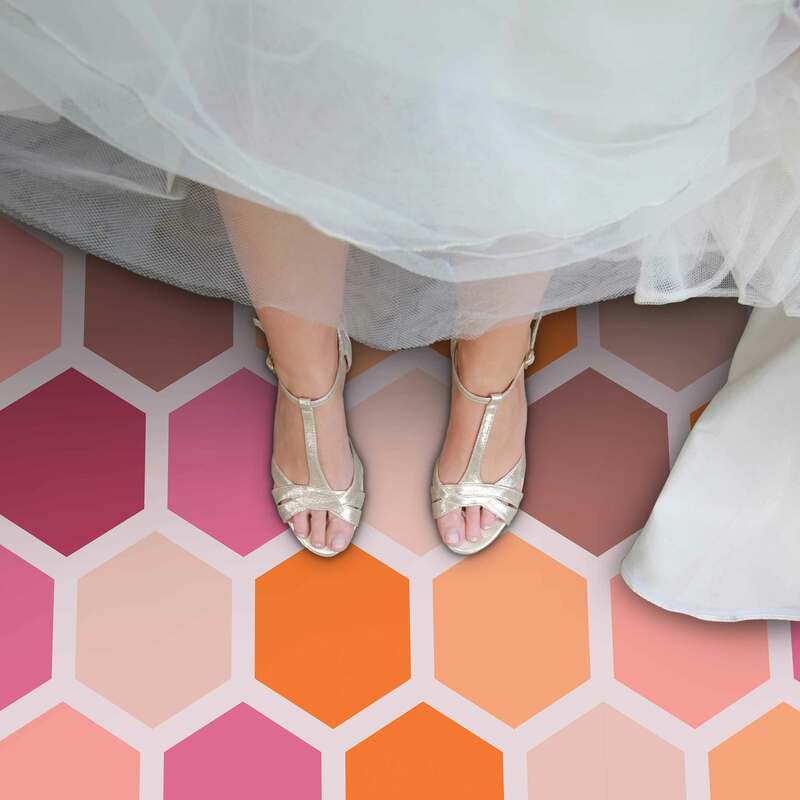 Our printed vinyl flooring know-how coupled with our custom design team work alongside you to make your fairytale ideas a wonderful reality. Go with a sophisticated floral floor and step down across a sea of petals or roses. Perhaps a design that means something intimate to you and your partner: a Moroccan or Italian tile pattern to remember a beautiful holiday. We know walking down that red carpet is so much more of a celebration when the red carpet was designed by you! Some of the options out there are for wedding aisle runners are thin fabrics and canvas. Imagine stepping down the aisle and just at that moment all eyes are turned on you and cameras clicking, the runner gets tangled under your heels….Hopefully, it would never happen to you. When asked to produce an aisle runner we looked at options and asked soon-to-be brides what they wanted. They desired a super durable product that when rolled down would stay flat on any floor. Nobody wanted to apply adhesive tape or use anything to stick down. They especially wanted something anti-slip and thinking of the above scenario, we could see exactly why! We looked at flooring or aisle products we could print. After a few days of forehead scratching, we tried our crystal-textured NuVifloor flooring and it worked a treat. It stays flat on the floor and is heavy enough to keep in place. It’s so hard wearing it can be reused again and again. A perfect choice for wedding planners. In fact, once the prosecco has finished, your wedding aisle runner can be rolled up and laid as a premium vinyl flooring in your home. How’s that for a permanent reminder of your big day! Available at up to 1.2m wide and a maximum of 20m in length. Bear in mind that 20m would be pretty weighty, this vinyl is super durable and built to last. Once you have decided, pick any pattern from the floorcoverings here or get in touch to let us know what theme or design has caught your attention. It’s your day, talk to us and let’s make memories. 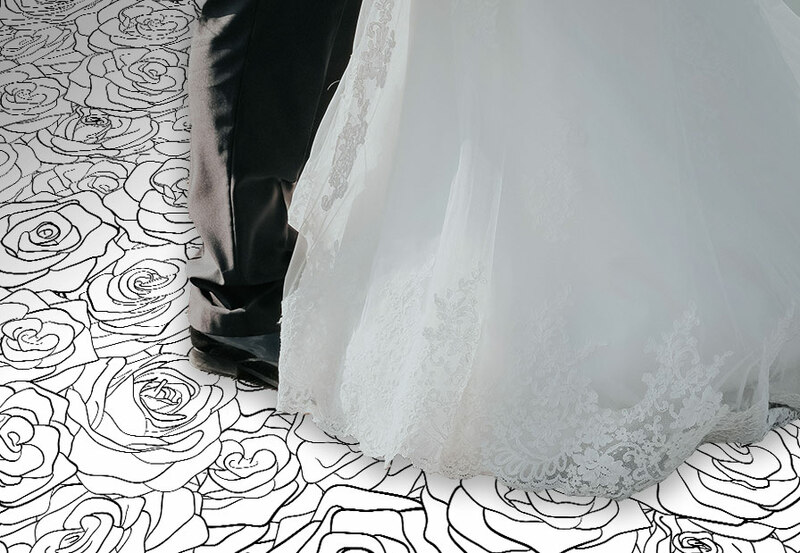 Whether you’re a wedding planner or planning your own wedding, our wedding aisle runners are guaranteed to make a matchless first impression. Interested? Contact us for a sample and we’ll post a square out for you. We’re sure we can be a glamorous part of your incredible day!